Prior to each concert, we will post a preview of the concert program, by sharing notes written by our Artistic Director and Conductor, Manny Laureano. Over the centuries concertgoers have been treated to a variety of music. From oratorios that celebrate a Biblical event or historical figure or to concertos featuring one or more instruments to fugues that challenge the ear to follow a progression of musically structured events, audiences have been given the opportunity to listen and make sense of collections of sounds. That opportunity was never greater than in the tone poems of Richard Strauss. To be sure, Strauss did not invent the idiom. Anyone who is familiar with Vivaldi’s Four Seasons or Heinrich Biber’s Battaglia or Wellington’s Victory of Beethoven understands that the idea of telling a story using musical lines, harmonies, and effects predates Strauss considerably. But a strong argument can be made in favor of his having set a new standard in how vivid a tone poem can be. 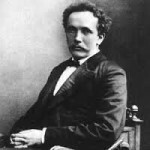 Strauss was already quite successful as a conductor of operas and symphonic works that were popular in the day. He was also ready to present his premiere of his first tone poem, Don Juan… when he had just finished his second, Tod und Verklarung or Death and Transfiguration. The speed at which he wrote is not surprising, however, when one considers that he had already written dozens of works by the time he got around to writing the kinds of music for which he would become best known. What is surprising is how well he found himself able to capture through melody and harmony a picture, a moment, a sentiment and have it become a boilerplate for so many that followed. It is even more surprising that he would do so well on the subject of the afterlife since he was not particularly religious himself. From its quietly painful opening to the transition into a C-major of childlike simplicity, Death and Transfiguration is cleansing to the listener after going though such palpable tumult with the subject of the story: The ailing elderly man who is, at first, so afraid of death but finds the peace he sought by finally embracing the path to which he is led. Whether it is the seductive portrait of Don Juan the lover, Till Eulenspiegel’s infectious laugh, Don Quixote’s delusional nobility, the eerie stillness of a climber on a mountain before a storm in the Alps, or the clear passing of a human being from this world to the next, Richard Strauss stands alone in his ability to create the scene in your mind through well-chosen melodies, harmonies, and perfect orchestration.